Atlassian's popular Confluence wiki can quickly be configured to use Crowd for user and group management. Lower than 2.6.2 該当なし Confluence does not support Crowd - please upgrade Confluence. In Confluence 2.8, the interface for atlassian-user changed. Crowd 1.3.2 is the earliest version to support this change. Note: As per CWD-2542 - Getting issue details... STATUS , atlassian-user support was removed as per Crowd 2.3. Thus, Crowd 2.2.7 is the latest version that will run with Confluence 3.4.8. Confluence 3.5 and above Crowd 2.1 or Later In Confluence 3.5 and above, the communication between Confluence and Crowd has been changed from SOAP to REST. Download and install Confluence (version 2.6.2 or later). Refer to the Confluence installation guide for instructions. We will refer to the Confluence root folder as CONFLUENCE. For the purposes of this document, we will assume that you have used the Crowd distribution (not EAR-WAR) (i.e. the easier) installation method of Confluence. If you need to install Confluence as an EAR/WAR, simply explode the EAR/WAR and make the necessary changes as described below, then repackage the EAR/WAR. Run the Confluence Setup Wizard, as described in the Confluence documentation. During this setup process, you will define the Confluence administrator's username and password. It is easier to do this before you integrate Confluence with Crowd. After setting up Confluence, shut down Confluence before you begin the integration process described below. The Confluence application will need to authenticate users against a directory configured in Crowd. You will need to set up a directory in Crowd for Confluence. For more information on how to do this, see Adding a Directory. We will assume that the directory is called Confluence Directory for the rest of this document. It is possible to assign more than one directory for an application, but for the purposes of this example, we will use Confluence Directory to house Confluence users. If you have an existing Confluence deployment and would like to import existing users and groups into Crowd, use the Confluence Importer tool by navigating to Users > Import Users > Atlassian Importer. Select 'Confluence' as the Atlassian product, and the Confluence Directory as the directory into which Confluence users will be imported. For details please see Importing Users from Atlassian Confluence. If you don't wish to import your Confluence users, make sure you use Crowd to create at least one user in the Confluence Directory and assign them to both the confluence-users and the confluence-administrators group. The Crowd documentation has more information on creating groups, creating users and assigning users to groups. Complete the 'Add Application' wizard for the Confluence application. See the instructions. Once Crowd is aware of the Confluence application, Crowd needs to know which users can authenticate (log in) to Confluence via Crowd. As part of the 'Add Application' wizard, you will set up your directories and group authorizations for the application. If necessary, you can adjust these settings after completing the wizard. Below are some examples. For details please see Specifying which Groups can access an Application. As part of the 'Add Application' wizard, you will set up Confluence's IP address. This is the address which Confluence will use to authenticate to Crowd. If necessary you can add a hostname, in addition to the IP address, after completing the wizard. See Specifying an Application's Address or Hostname. The instructions for step 2 below apply to Confluence 3.5 or newer. If you use Confluence 3.4 or older, please follow "Step 2" on Integrating Crowd with Atlassian Confluence 3.4 or earlier instead. Confluence can use Crowd for user authentication simply by adding the 'Atlassian Crowd' user directory. Log in to Confluence Admin as 'confluence-administrator'. Click on the 'User Directories' label of the left bar under the 'Security' tab. Click 'Add Directory'. Then select 'Atlassian Crowd' from the dropdown list. Click 'Next'. Enter connection parameters and save. Now a new Crowd directory should appear on the user directory list. For more information on configuring a Crowd remote directory in Confluence, check out the Confluence documentation on Connecting to Crowd or Jira for User Management. If Confluence is running, shut it down first. Copy the crowd.properties file from CROWD/client/conf/ to CONFLUENCE/confluence/WEB-INF/classes. If your Crowd server's port is configured differently from the default (i.e. 8095), set it accordingly. This is the number of minutes between validation requests, when Crowd validates whether the user is logged in to or out of the Crowd SSO server. Set to the required number of minutes between validation requests. The recommended default is 2 minutes. Setting this value to 1 or higher will increase the performance of Crowd's integration. Setting this value to 0 will cause the application to perform authentication checks on each request but can cause poor performance, especially with Crowd 2.1 - Crowd 2.3.2 using REST due to CWD-2646. It is possible to define multiple user directories in Confluence. 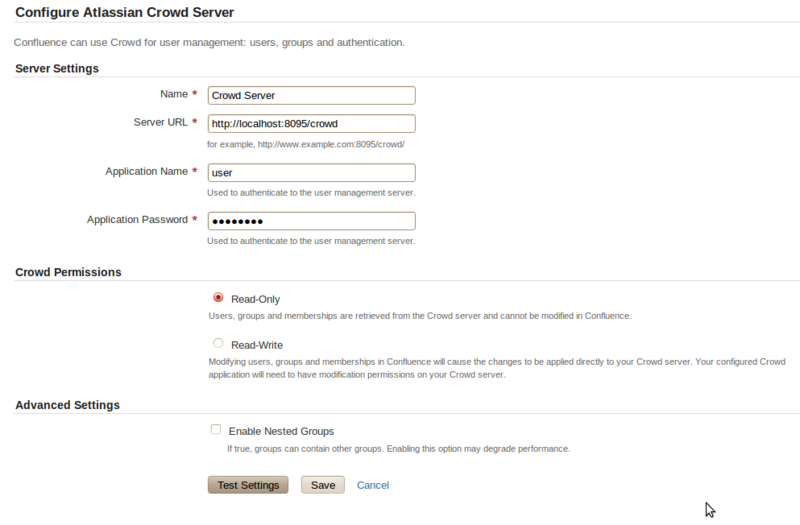 However, if you enable Crowd SSO integration, you will only be able to authenticate as users from the Crowd server defined in the crowd.properties file. disable Crowd SSO by reverting back to the default Confluence authenticator. Users belonging to the confluence-users group should now be able to log in to Confluence. Try adding a user to the confluence-users group using Crowd — you should be able to log in to Confluence using this newly created user. That's centralized authentication in action! If you have enabled SSO, you can try adding the Confluence Directory and confluence-administrators group to the crowd application (see Mapping a Directory to an Application and Specifying which Groups can access an Application). This will allow Confluence administrators to log in to the Crowd Administration Console. Try logging in to Crowd as a Confluence administrator, and then point your browser at Confluence. You should be logged in as the same user in Confluence. That's single sign-on in action!